Mike Slavney, FAICP, Principal Planner | Vandewalle & Associates, Inc.
Mike Slavney is the director of planning services for Vandewalle & Associates. In this role he coordinates the firm’s activities in providing general planning services to municipalities, state agencies, and organizations. 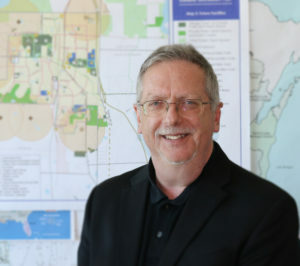 He is a nationally recognized leader in zoning, growth management, development review and negotiation, farmland and open space preservation, intermunicipal planning, participatory techniques, indirect and cumulative impact analysis, and plan implementation. Mr. Slavney was inducted as Wisconsin’s second Fellow of the American Institute of Certified Planners (FAICP) in 2004. Mike’s practice includes comprehensive planning, land use planning, transportation planning, neighborhood planning, park and recreation planning, development regulation (zoning, subdivision, and related ordinances), intergovernmental relations, public participation, and municipal planning services. He generally serves on planning projects as the lead planner, or as a lead specialist. Mr. Slavney also provides strong expert testimony services on a broad range of planning and development topics. Mike has been certified by the American Institute of Certified Planners since 1985 and has been a practicing consulting planner since 1981. Prior to joining Vandewalle & Associates, he served as the director of planning and development for the City of Sun Prairie, Wisconsin; as the senior associate planner for Lane Kendig, Inc.; and as the principal long-range planner for the City of High Point, North Carolina. Mike’s clients include over 100 municipalities and counties, numerous state agencies, school districts and organizations, and many developers- principally in the Chicago, Milwaukee, and Madison areas. Mike’s practice has continuously focused on the efficient implementation of achievable plans-particularly those that forward the mutual accomplishment of economic, environmental and community character objectives. Mike knows how to make creative plans a reality one step at a time. You can email Mike here.